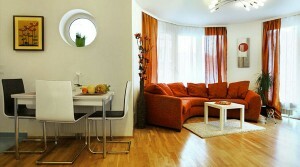 Conveniently located, this beautifully decorated 53m² two-room apartment offers comfort to accommodate up to 4 people. The apartment is located in a new residential building with elevator access in the popular district of Neubau, a few minutes away from Vienna’s center. 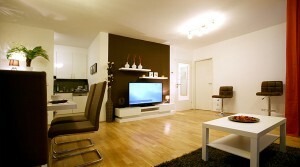 This fantastic 55 m² apartment lies in the art district of Margareten. 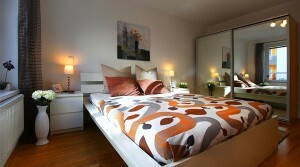 The apartment offers great comfort and a sense of wellbeing for up to 4 guests. Many famous theaters, museums, restaurants and sightseeing are within walking distance. This sunny apartment with south-east exposure is located in one of the oldest and most prestigious districts – Josefstadt. Located on the 3rd floor of a building with elevator access, the apartment has an area of about 55 m² and is suitable for up to 4 people. It has a large circular living room surrounded by floor-length French windows leading to a 12 m² balcony with a wonderful view of the picturesque Tiger Park. Fall in love with this luxurious Viennese apartment – a magical combination of top location, elegance and true home comfort. This cosy suite is located in a new residential building with elevator access in the historical district of Alsergrund, a few minutes away from Vienna’s majestic Old City. It has an area of 60 m2 and is perfectly designed to accommodate up to 6 people. 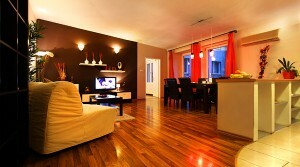 This fantastic 52 m2 apartment lies in the art district of Mariahilf. Situated on the 2nd floor of a new house with elevator access, the apartment offers great comfort and a sense of wellbeing for up to 5 guests. Many famous theaters, museums, restaurants and sightseeing are within walking distance. This 69 m2 courtyard apartment, which is situated on the 2nd floor of a residential building, is extremely well-located in the Meidling District. As a crossing point between the Viennese city center, the magnificent Schoenbrunn Palace and the famous shopping street Mariahilferstrasse, this lovely property offers quiet comfort for up to 5 guests and excellent public transport connections.